AT&T’s $39 billion takeover of T-Mobile is on hold in the federal courts as the parties look for a new way to structure a deal that could get approval from regulators. The merger is currently tied to a federal antitrust lawsuit, which was postponed today. AT&T and Deutsche Telekom, the parent company of Bellevue, WA-based T-Mobile USA, asked for the delay along with the Justice Department. In a joint statement on their website dedicated to promoting the transaction, AT&T said it was still working with Deutsche Telekom to find a deal—even if that’s different than the wholesale purchase first contemplated. “We are actively considering whether and how to revise our current transaction to achieve the necessary regulatory approvals so that we can deliver the capacity enhancements and improved customer service that can only be derived from combining our two companies’ wireless assets,” the AT&T statement says. The judge in the case is asking the companies to come back with an update by Jan. 12, although generally speaking those deadlines can be changed if parties ask for more time. If you see that deadline getting delayed, especially if the DOJ is among those asking for more time, it’s a sign of a possible resolution in the works. This story probably goes one of two ways at this point: Either AT&T comes up with a new kind of transaction that satisfies the feds and leads to a lawsuit settlement and FCC approval, or it gets called off and AT&T ponies up its hefty $4 billion breakup fee. 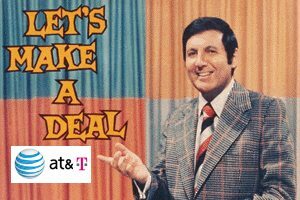 Maybe there are two and a half possible outcomes, since I guess Deutsche Telekom could let AT&T off the hook on at least some of the cash and spectrum at stake for a failed merger—but that would still leave the nagging question of what to do with a fourth-place carrier (T-Mobile) that its owner does not want.